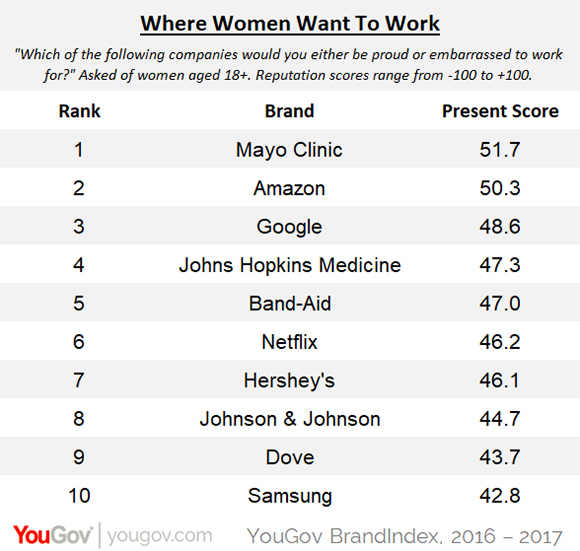 Mayo Clinic, Amazon, and Google top YouGov BrandIndex's ranking of the brands women say they would be most proud to work for. With the ouster of Bill O'Reilly and Harvey Weinstein creating conversations about sexual harassment in the workplace, YouGov BrandIndex looked at the brands women want to work for most by reviewing daily data from the past two months. Half the brands in the top 10 fall into this category: Mayo Clinic (#1), Johns Hopkins Medicine (#4), Band-Aid (#5), Johnson & Johnson (#8), and Dove (#9). The next highest brand in this category is Neutrogena (#24). Johnson & Johnson has been subject to numerous lawsuits tying its talcum powder to instances of breast cancer over the past few years, but it is a testament to the brand that they still held on for the top 10. Amazon (#2), Google (#3), and Netflix (#6) are already nestled on YouGov BrandIndex’s ranking of the 10 best perceived brands of 2017. Although these companies were founded by the men who are still running them, they are considered very progressive in their workplace culture and employee benefits. On the other end of the scale are the brands that women say they’d be most embarrassed to work for. The lowest score belongs to Hooters dining chain, with Viagra and Motel 6 right behind it. Other brands with some of the lowest Reputation scores: World Wrestling Entertainment, Super 8 Motels, 5-Hour Energy, Trump Hotels, Fox News Channel, Ivanka Trump clothing, Match.com, and eHarmony.